Enfield is a town in Hartford County, Connecticut, United States. The population was 44,654 at the 2010 census. It is bordered by Longmeadow, Massachusetts and East Longmeadow, Massachusetts to the north, Somers to the east, East Windsor and Ellington to the south, and the Connecticut River (towns of Suffield and Windsor Locks) to the west. The modern town of Enfield was formed through the merging of Enfield, Thompsonville, and Hazardville, named for Colonel Augustus George Hazard (1802–1868), whose company manufactured gunpowder in the Powder Hollow area of the town from the 1830s to the 1910s. In the 1989 film Glory, boxes of gunpowder can be seen with the words Enfield, CT printed on the sides. In an episode in the 1970s police drama Hawaii Five-O, Jack Lord's character Steve McGarrett traces explosives back to "The Hazard Gunpowder Company- Enfield, CT". The capacity of the mill at the time of the Civil War was 1,200 pounds (540 kg) per day. Over 60 people died in explosions in Powder Hollow during the years when gunpowder was manufactured there. The mill blew up several times, but was set up so that if one building blew up, the rest would not follow in a chain reaction. The ruins of these buildings and the dams are open to the public. Powder Hollow is now home to baseball fields and hiking trails. 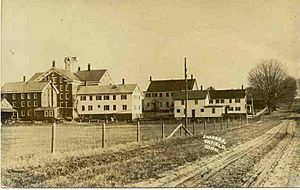 In 1793, a historic Shaker village, Enfield Shaker village, one of nineteen scattered from Maine to Kentucky, was established in the town. The Utopian religious sect practiced celibate, communal living, and is today renowned for its simple architecture and furniture. Membership eventually dwindled, however, and the village disbanded. The property has since been redeveloped by the Enfield Correctional Institution, still located on Shaker Road. 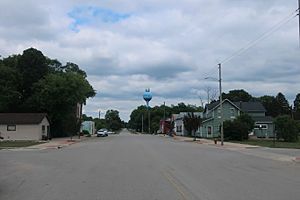 According to the United States Census Bureau, the town has a total area of 34.2 square miles (88.6 km2), of which 33.3 square miles (86.2 km2) is land and 0.93 square miles (2.4 km2), or 2.76%, is water. As of the census of 2000, there were 45,212 people, 16,418 households, and 11,394 families residing in the town. The population density was 1,354.3 people per square mile (523.0/km²). There were 17,043 housing units at an average density of 510.5 per square mile (197.1/km²). The racial makeup of the town was 89.74% White, 5.61% African American, 0.20% Native American, 1.34% Asian, 0.02% Pacific Islander, 1.57% from other races, and 1.54% from two or more races. Hispanic or Latino of any race were 3.74% of the population. There were 16,418 households out of which 31.1% had children under the age of 18 living with them, 55.7% were married couples living together, 10.2% had a female householder with no husband present, and 30.6% were non-families. 25.0% of all households were made up of individuals and 9.5% had someone living alone who was 65 years of age or older. The average household size was 2.53 and the average family size was 3.04. In the town, the population was spread out with 22.6% under the age of 18, 7.6% from 18 to 24, 34.2% from 25 to 44, 21.9% from 45 to 64, and 13.7% who were 65 years of age or older. The median age was 37 years. For every 100 females there were 110.2 males. For every 100 females age 18 and over, there were 112.7 males. The median income for a household in the town was $67,402, and the median income for a family was $77,554. Males had a median income of $42,335 versus $31,082 for females. The per capita income for the town was $29,340. About 2.8% of families and 4.0% of the population were below the poverty line, including 3.4% of those under age 18 and 5.7% of those age 65 or over. "Crescent Lake"-Borders scenic farmland. It is in close proximity to both the minimum and maximum correctional facilities. This small friendly neighborhood holds an annual July 4 parade. Enfield Historical District- Listed in the National Register of Historical Districts, the Enfield Historical District runs along Enfield Street/King Street (U.S. Route 5). Many old homes dating back to the mid-18th century were built from 1106-1492 Enfield Street. Varying styles of architecture are noted including Late Victorian, Georgian and 19th Century Revival. The Enfield Town Hall museum as well as one of the oldest Congregational Churches in America can be found here. Hazardville - Named after Colonel Augustus Hazard, this neighborhood encompasses a few smaller burbs, including Powder Hollow, and more recently, the center of Enfield began to encroach on this historical area. The center of Hazardville is located between the streets of Park Street and North Street on Hazard Avenue. Notable small shops include The Connecticut Valley Tobacconist, Gayle's Thyme Herbal Apothecary, The Cranberry Scoop Gift Shop, Smoke n' Leather, and numerous pizzerias. The Powder Hollow Park is located in the Hazardville neighborhood district. North Thompsonville - Contains mostly residential and partially commercial areas of Enfield with many parks and schools. Presidential Section - This entirely residential area contain streets that are all named after former presidents of the United States. Houses are mid-sized to large in this area. Scitico - located in the eastern end of town. Green Manor is considered part of Scitico. This is a suburb in the purest sense, with winding roads, sidewalks, a park, and cul-de-sacs. 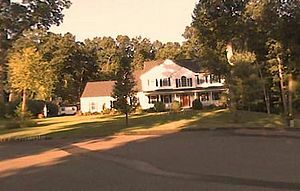 Green Manor is approximately 4.5 miles (7.2 km) from the main highway Interstate 91 and borders the town of Somers. Across from Nathan Hale Elementary School is a residential park with tennis court, skate boarding ramps, and a playground for younger kids. Green Manor Park contained a pool at one time but was removed due to the lack of maintenance by the town. Shaker Pines - This neighborhood consists mostly of quaint lakeside houses with tall pine trees towering overhead. Shaker Pines was originally part of the Shaker settlement in Enfield. The lake was built by the Shakers to power a mill. The mill stood vacant by the dam at the end of the lake, until it was dismantled in the 1980s. This mill provided shelter for Frederick Merrill in 1987 after he escaped from the local high security prison. He was dubbed "The Peanut Butter Bandit" after his mother sneaked him supplies for his first prison escape in 1968 in a jar of peanut butter. Southwood Acres - A residential neighborhood in the south part of town. 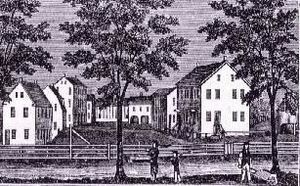 Thompsonville - Named after Orrin Thompson, Thompsonville is the town center of Enfield with a more urban environment. In the past few years, there has been an attempt to revitalize the downtown area. On the southbound portion of Pearl Street there are many old Victorian houses. There are also many boat launches onto the bordering Connecticut River. Commuter rail service is expected to begin in 2013, and planning has started for renovating an old building into a train station and transportation hub on the proposed Hartford Line. Enfield and Thompsonville are currently served by the Connecticut Transit commuter bus services for easy access to and from Hartford. Brainerd Park: on Brainard Road, features softball fields, children's swing sets. Enfield is home to the New England Lightning girls AAU basketball program. The Strand Theatre (Enfield Cinema), most prominently active in the 1940s and '50s. In the '70s the Strand had to resort to X-rated films to remain afloat until finally closing doors in the 1980s. Locals have many ideas for the future of the theater, but it is in great disrepair. Bigelow-Sanford Carpet Co., now Bigelow Commons, a renovated apartment complex. These buildings were the site of a large carpet company that employed many in the town. Listed in the National Register of Historic Places. 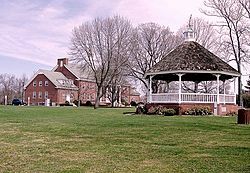 Enfield, Connecticut Facts for Kids. Kiddle Encyclopedia.